Someone said “no one can see future” was true but fortunately we live in today’s world were online application has made everything possible. Now you can see future, all you need to do is upload your photo and application will show how you look in 20 years. Not only seeing yourself older but you can see your future children’s too. How to See Yourself Old? In20years is a website which can help you see yourself old. All you have to do is upload your photo and then using advanced face detection and morphing technology, application will show you how your face would look like in 20 or 30 years from now. You don’t have to do anything their magical engine turns your face old automatically also if you were a drug addict you can see what future holds for you! How to See Your Future Children? Introducing, MakeMeBabies to help you see your future babies. Here you need to upload two photo’s, one of your and another of your partner (to whom you want to see your babies with) and make a baby in seconds! After uploading your photo they’ll give three options, upload partner photo, bake babies with celebrities (list of celebrities is available on list), or sent request via email. This application is using advanced face detection technology to predict what your baby will look like. And after a message “Please hold on while we make your baby… it shouldn’t take more than 9 months” you’ll see your future baby. 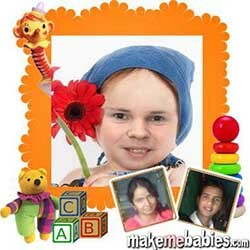 I have used this application to see baby of one of my friend with her boyfriend and here is the result. Enjoy using this two applications and let us know in comment with whom you made your baby. In20years and Makebabies are the link in the article above for you to start.